The ingredients synergy of Viazen Sleep is the key of the effectiveness of this SUPERIOR FORMULA. 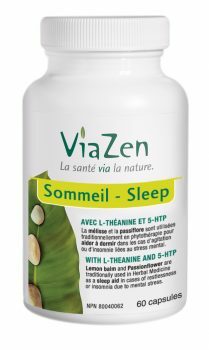 ViaZen Sleep offers a natural and effective solution to quickly counter occasional or chronic insomnia, as well as daytime discomforts as a result. Viazen Sleep causes neither addiction nor physical dependence. This medicinal plant is recognized to relieve anxiety, agitation and sleep disorders. This medicinal plant is recognized to reduce stress, anxiety and nervousness and to relieve muscular spasms and nerve pain. This natural molecule is used as sleep-aid. It is a serotonin precursor, an essential neurotransmitter to the regulation of the sleeping activity. 5-HTP is also recognized to cure anxiety panic attacks and mood disorders. This amino acid extracted from green tea contributes to increase dopamine, serotonin and GABAs production at the cerebral level. These three neurotransmitters are respectively associated to wellbeing, mood modulation and anxiolytic sensation. It also supports the production of the alpha cerebral waves, which are responsible for a relaxation state and a reduction of the anxiety. It generates calming and alkalizing effects and a relaxation state at the muscular level. It also supports the nervous and the adrenal glands functions, as well as the activation of several enzymes implicated in the physiological reactions of acute and chronic stress. * Daily dosage corresponding to 2 capsules of Viazen Sleep. Cellulose, vegetable magnesium stearate, gelatine. Viazen Sleep is free of wheat, soy, corn, yeast, peanut, gluten, egg and dairy products. It does not contain preservatives, sweeteners, colouring agents, artificial flavours and is exempt of GMOs. ViaZen Sleep is recommended on a regular basis at the dosage of 2 capsules a day with food, 30 to 45 minutes before sleeping. The benefits should start to be observed within a few days, but optimal results should be observed after a few weeks of use. 1) Disappearance of morning tiredness and drowsiness during the day. 4) Suppression of nocturnal awakenings. 6) Improvement of alertness, memory and concentration during the day. Consumption of this product with alcohol, other medications or natural health products with sedative properties is not recommended. Consult a health care practitioner if sleeplessness persists continuously for more than 3 weeks (chronic insomnia) or worsens. Consult a health care practitioner prior to use if you are pregnant, breastfeeding, taking carbidopa or drugs/supplements with serotonergic activity. These drugs/supplements may include, but are not limited to, L-tryptophan, S-adenosylmethionine (SAMe), St. Johns wort, antidepressants, pain killers, over the counter cough and cold medication containing dextromethorphane, anti-nausea medication and anti-migraine medication. Discontinue use and consult a health care practitioner if you show signs of weakness, oral ulcers or abdominal pain accompanied by severe muscular pain or if you experience skin changes. Some people may experience drowsiness. Exercise caution if operating heavy machinery, driving a motor vehicle, or involved in activities requiring mental alertness. Hypersensitivity (e.g. allergy) has been known to occur; in which case, discontinue use. Some people may experience diarrhoea, nausea, vomiting or abdominal pain. Insomnia is a disorder implying a reduction of sleep time, a sleep disturbance or a poor quality of the sleep. Insomnia is a symptom, and its most frequent causes are stress, anxiety and depression. In a more specific way, insomnia can be transient or occasional if it lasts from one to many nights during a single period of adaptation. It is generally related to life events (work problem, bereavement, disease, anxiety, intense physical exercise, use of psychoactive stimulants (alcohol, hallucinogen, caffeine, nicotine, heavy meal taken in evening, drugs, etc), to changes of sleep schedule or the environment (jet lag, shift work hour, moving to a new room, noises, luminosity). Insomnia can also be of short duration, i.e. from a few days to three weeks. It is usually associated with a prolonged stress either during convalescence, after a surgery or a short disease. Chronic insomnia lasts during months or years. It can be associated with neurological or mental disorders, with hormone shifts (menopause, thyroid disorders, etc), with chronic pain, sleep apnea and restless legs syndrome. Insomnia represents a clinical problem in cases of difficulty in falling asleep or inability returning to sleep after nocturnal awakenings and lasts three nights or more per week. Also, when it is associated with impairments of daytime functioning, and when sleep problems are present for more than one month. Insomnia is observed in presence of: difficulties in falling asleep (sleep-onset insomnia), frequent or prolonged nocturnal awakenings (middle of the night insomnia), waking too early in the morning (terminal insomnia), a daytime persistent drowsiness in spite of adequate sleeping hours (poor quality of the sleep). Insomniacs often present disorders of attention and memory, difficulties of concentration, tiredness, irritability and impatience. The states and the stages of human sleep are determined by a record traced by electroencephalography. The standard night of sleep is made of alternative periods of slow sleep (stages I to IV) and of paradoxical sleep. The normal nocturnal sleep of an adult is constant one night to the other night. After drowsiness, the sleep passes usually by all the stages. The deep sleep (stage IV) accounts for 15 to 25% of the total nocturnal sleep. The disorganisation and/or the suppression of the phases of the sleep will generate insomnia. The amount of the required sleep decreases with the age. The sleep becoming more fragile, the elderly persons are often awaked by external stimulations, including noise, light or pain. Neurophysiology specialists showed that serotonin is the main neurotransmitter at the origin of the sleep, whereas catecholamines (adrenalin and noradrenalin) are considered as responsible of the waking state. Thus, inadequate serotonin levels will generate insomnia. 1. Bruni O, Ferri R, et al. L-5-hydroxytryptophan treatment of sleep terrors in children.Eur J Pediatr.2004 163(7):402-7. 2. Buchner KH, Hellings H, Huber M, and et al. [Double blind study as evidence of the therapeutic effect of Melissengeist on psycho-vegetative syndromes]. Medizinische Klinik 1974;69(23):1032-1036. 3. Gagnon R. La nutrithérapie. Éditions Amyris. 2008. 287 pages. 4. Harrison. Principes de médecine interne. 15e édition. Médecine-Sciences Flammarion. 2002. 2630 pages. 5. Kahn RS, Westenberg HG, et al. Effect of a serotonin precursor and uptake inhibitor in anxiety disorders; a double-blind comparison of 5-hydroxytryptophan, clomipramine and placebo.Int Clin Psychopharmacol 1987 Jan;2(1):33-45. 6. Kennedy DO et al. Attenuation of laboratory-induced stress in humans after acute administration of Melissa officinalis (Lemon Balm). Psychosom Med. 2004. Jul-Aug;66(4) :607-13. 7. Kennedy DO et al. Modulation of mood and cognitive performance following acute administration of Melissa officinalis (Lemon Balm). Pharmacol Biochem Behav. 2002. Jul;72(4) :953-64. 8. Kennedy DO et al. Modulation of mood and cognitive performance following acute administration of single doses of Melissa officinalis (Lemon balm) with human CNS nicotinic and muscarinic receptor-binding properties. Neuropsychopharmacology. 2003. Oct;28(10) :1871-81. 9. Khondzadeh S, Naghavi HR, et al. Passionflower in the treatment of generalized anxiety: a pilot double-blind randomized controlled trial with oxazepam. J Clin Pharm Ther 2001 Oct;26(5):363-7. 10. Kennedy DO et al. Attenuation of laboratory-induced stress in humans after acute administration of Melissa officinalis (Lemon Balm). Psychosom Med. 2004. Jul-Aug;66(4) :607-13. 11. Kimura K, Ozeki M, Juneja LR, Ohira H. L-Theanine reduces psychological and physiological stress responses. Biol Psychol. 2007 Jan;74(1):39-45. 12. L-Theanine. Alternative Medicine Review. 2005. Vol 10(2). 136-38. 13. Lakhan SE, Vieira, KF. Nutritional and herbal supplements for anxiety and anxiety-related disorders : systematic review. Nutrition Journal. 2010; 9 :42. 14. Lu K, Gray MA, Oliver C, Liley DT, Harrison BJ, Bartholomeusz CF, Phan KL, Nathan PJ. The acute effects of L-theanine in comparison with alprazolam on anticipatory anxiety in humans. Hum Psychopharmacol. 2004 Oct;19(7):457-65. 15. Marieb E. Anatomie et physiologie humaines. ERPI.1993. 1013 pages. 16. Maron E, Toru I, et al. The effect of 5-hydroxytryptophan on cholecystokinin-4-induced panic attack in healthy volunteers.J Psychopharmacol. 2004 18(2):194-9. 17. Nobre AC, Rao A, Owen GN. L-theanine, a natural constituent in tea, and its effect on mental state. Asia Pac J Clin Nutr. 2008;17 Suppl 1:167-8. 18. Pharmacology and therapeutic uses of theanine. Am J Health-Syst Pharm. 2006; 63(1): 26-30. 19. Petit Larousse de la médecine. Larousse. 1992. 20. Schruers K, van Diest R, et al. Acute L-5-hydroxytryptophan administration inhibits carbon dioxide-induced panic in panic disorder patients.Psychiatry Res. 2002 113(3):237-43.